This sleek goggle commands attention with its oversized spherical lens and virtually rimless frame. The Bolle® Emperor has a wide field of view, Equalizer® technology and Flow-Tech® venting to keep the goggle view fog-free all day long. Triple layer face foam provides comfort on the slopes and in the park until the stars come out. Wide field of view ensures maximum peripheral view, necessary when you are flying through the slalom gates or spinning to spot a landing over your shoulder. 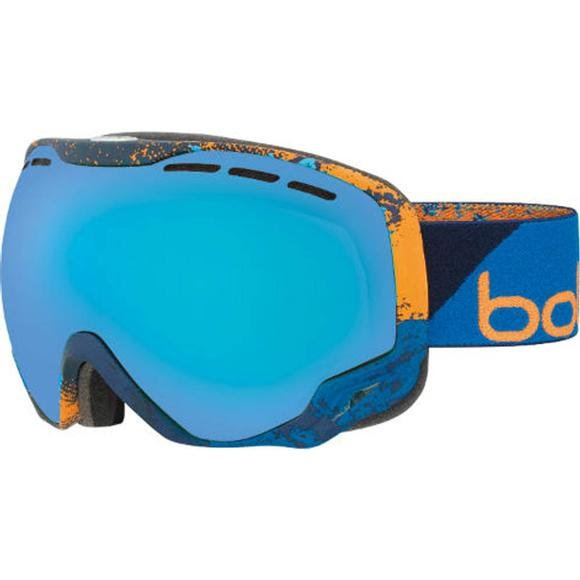 The Gravity features a unique new spherical shield, designed with a steeper curve to provide face hugging fit and the widest field of view in a spherical goggle. Ultra soft fleece is the only material in contact with your face. Bolle® Equalizer technology uses a waterproof, breathable vent to Eliminate Any moisture. The result is distortion free vision and no fogging at Any Altitude. These goggles were for my son, and we a step up or two in quality from our usual goggles. The only problem is they really are excellent quality and now we will have to by similar pairs for the rest of the family! These goggles seem great. They have a lot more ventilation than my old googles. Also the lenses do a great job of relieving eye strain in bright conditions.